The following interview between Petar Protić and Aleksandar Matković originally appeared in Serbo-Croatian at Al Jazeera Balkans and concerns the recent labour laws that have been carried out almost simultaneously across several Balkan countries, each bearing similar tendencies: a weakening of workers’ rights and a strengthening of the rights of employers, the increase of precarious work and employers arbitrarily assigning work times as they see fit. These labour reforms form one of the central topics of the interview. Protić: Recently the Chinese company Hesteel Serbia, which operates the Smederevo ironworks, requested that the Serbian government amend its labour laws because the management believes that it should have the right to burden workers with additional duties. 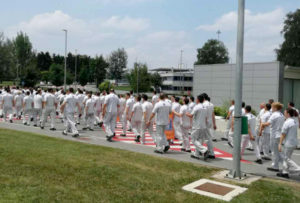 At the same time, in the case of the Fiat strike, the state intervenes not by amending the operation of the company, which has evidently violated the law, but by negotiating with the maltreated workers. These two pictures, which have circulated through the media, suggest that Serbia is unambiguously in the service of large capital, which is of direct concern to the workers. Matković: Fiat and Hesteel are two faces of the same investment policy: if you ask what connects the recent strikes in Serbia, it is the fact that they all occurred in foreign-owned firms. Geox, Yura, Goša, Gorenje Valjevo and many others are living proof of the failure of the government’s policies of relying on foreign investors. The entire economic policy of Serbia rests on the refusal to regulate domestic labour markets, although its structure of unemployment ensures that there is more than an adequate supply of vocatioal and educational profiles to meet the current demand. However, instead of investing in local infrastructure, the saviour to the ailing Serbian economy is seen mainly in the chaos of foreign investment. The budget is burdened by huge subsidies paid out to foreign investors, while the employees are disciplined with open violence. 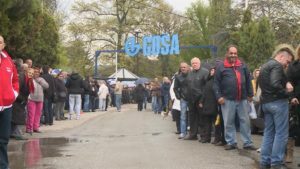 From Hesteel’s demand that their workers be kept at their disposal 24 hours a day while living in a barracks (that’s why they demanded the labour law be changed), to the catastrophic situation in Goša and the fiasco at Fiat Chrysler in Kragujevac, literally not a single foreign-owned factory is operating legally. In addition, Serbia’s is the cheapest work force in Europe and no investment can justify such a degradation of the working class. Further, the additional lowering of the price of labour is senseless because it is already low; and because investments do not go after cheap labour but after profit: that’s why the bulk of the finished products produced in Serbia returns to the countries of origin where the highest profits are made. In this sense, foreign direct investments do not “exist” – only the turnover of capital. And what remains behind after this turnover is the literally cheap destruction of the employees, of their families and cities, the ruination of their health and the impossibility of the maintenance of life. In a word: a crisis of reproduction. Protić: However, in order to arrive at an understanding of the labour laws, we must take a step back. It is well known that the economic development of the Balkan countries is largely dependent on Washington institutions such as the World Bank and on the so-called “Troika” (the IMF, European Central Bank and the European Commission). And, as you have remarked, it was the breakup of Yugoslavia that opened the path to the liberalisation of the market. Matković: First, following the breakup of Yugoslavia, the former Yugoslav republics found themselves between two forms of neoliberalism. The first wave followed the Reagan-Thatcher period and the so-called Washington Consensus, otherwise known as the “Ten Commandments” of neoliberalism. This set of policy prescriptions is what the World Bank had initially applied to developing regions in Latin America and subsequently in Europe after the fall of socialism. This reached its peak during the 2000s. The key reform in the former Yugoslav republics, alongside the changes to forms of ownership, was the reform of labour laws and of the institutions of what was once the system of socialist self-management. The second wave developed in the other half of the 2000s along the Berlin-Brussels axis (and the IMF-European Bank, respectively) and was accompanied by austerity measures, the consolidation of the EU and the polarisation between its centre and periphery. The position of the Balkans in this constellation is seen today in the Berlin Process, which has suspended European integration until 2018 and has instead focused on the creation of a single Balkan market with Vučić at its helm. Both waves have influenced the party programs of the former Yugoslav republics: already during socialist times there was a willingness to privatise, but this went hand in hand with nationalism. After Ante Marković abolished the system of workers’ self-management overnight, the first beginnings of privatisation could already be seen during the 1990s – in the figure of Slobodan Milošević. Milošević’s anti-bureaucratic rhetoric prior to his rise to power included demands for attracting foreign capital and the liberalisation of the markets. It was only with the imposition of sanctions that he re-nationalised the Yugoslav industries. And even Zoran Đinđić’s liberalism would not subsequently distance itself from that faithful combination of nationalism and proto-neoliberal politics. They remained interlocked. Of course, there is also this leftist narrative according to which it was the influence of the IMF in promoting centralisation inside the federal government that facilitated the collapse of Yugoslavia, with Michel Camdessus, the fund’s director at the time, even writing of a “silent revolution” in the socialist Balkans. However, a few remarks are needed here. First of all, we need not exaggerate the “foreign” influences on Yugoslavia’s collapse. One must not overlook the internal problems of self-management which had undergone great transformations since its inceptions during the 1940s and the 1950s. At the time Boris Kidrič was alive, that system of self-management had included the Council of Producers in the National Assembly, various investment funds, socialist accumulation, etc. None of these were existent by the 1980s. And in the meantime the republican governments had been strengthened with the Communist Party losing its former political role. And you have the oft forgotten wave of mass strikes during the 1980s which, despite the passivity of the trade unions, demanded the preservation of socialism. Secondly, we cannot mitigate the role of domestic nationalism. The right was and remains pro-capitalist and market-oriented, but alongside the political parties it had widespread support from the Serbian Academy of Sciences and Arts, the intellectual elite and state security institutions. The war was waged by para-military formations close to them and the entire right-wing compound that resulted from their interaction led to the end of the SFRY. Today, it still lives on, in an altered form. Protić: In your research you note that the last reforms of the labour law in Serbia follow the wider trend of reforms that has taken place throughout the Western Balkans, with the Serbian law relying on the Croatian, which was in turn based on the Slovene law. The problem which you highlight is the neoliberal legal framework of these acts through which precarious labour is, effectively, legalised. These and other practices that are negative for the workers, had earlier been snuck in through the back door, but are now for the first time recommended by the new law and have been established as the standard. Matković: Precarious labour had also existed in previous laws, but merely as an exception to the rule. With the institutionalisation of neoliberalism in the former Yugoslav republics, a pan-Balkan (so to speak) form of austerity-led state arrangements has been created. It comprises mutually interconnected states bound by market integration and long-term austerity, which means that their austerity measures are no longer an expression of urgency or a specific answer to a crisis but are built to last. In this context of a “Balkan neoliberalism”, labour laws play a key role in the standardisation of precarious labour which is no longer an exception but the rule, with huge concessions to the employers. Multi-year “short term” contracts, easier dismissals, flexible working hours, holidays, etc, all of this entwines the labour law into the existing “flexible” labour relations. But contrary to how it is currently presented, this labour law is only the tip of the iceberg: after it there are a series of laws which will further enroot this precarity into society. The dual education law, for example, which foresees a double-tier education system with mandatory work in domestic and foreign companies for the “lower strata” of the young specialised workforce. These young workers would have no legal protection as they are not allowed to make any contracts themselves; instead, the labour contracts will be signed between the employer and the school. Or the set of five sectoral public sector laws, which will standardise volunteer work and unpaid internships in different parts of the public sector. Or, finally, the law on agency employment, which will standardise the practice of private employment agencies organising, allocating and relocating workers at the will of their clients (construction companies, big firms, private industries, etc), a system already practised in Croatia and Slovenia. All of these laws mark a new institutional matrix being created based on long-term changes to the entire infrastructure of both the private and public sector. At the same time, it changes the conditions of the possibilities for resistance. Protić: And resistance in this context means, I presume, the creation of new legal frameworks based on deep economic analyses. What alternatives are there at present and what things require the most urgent attention? Matković: Different alternatives exist, but the majority of them focus on legal battles only. The labour law is just one side of the coin, however. The above-mentioned laws that will follow it present major institutional reforms and should also be taken into account. For as such they craft an institutional totality that will function in sync. And that’s why every alternative must also suggest a counter-institutional framework which will depart from the current status quo. Legally, the labour law should shorten the length of precarious contracts from the current three years to six months to prevent the present abuses (how, for example, will your hospitals work if there is a constant turnover of staff? Or, say, scientific institutes for the development of technologies or medicine? These are already stagnating in the current state of affairs, and this is yet again solved through foreign investments). The definition of labour time, of flexible working hours (article 50), which is absurdly vague, should be thrown out or redefined in such a way that an employer cannot rearrange working hours in the so-called redistribution period (article 58) except in extraordinary circumstances. Hesteel’s demand, for example, that their workers be made totally available 24 hours a day should be vigorously opposed. The articles which regulate the termination of a contract must not favour the subjective assessments of the employer. Article 179, which does just this (that is, it would allow dismissals without a court ruling if the employer merely suspects that the employee committed a criminal offense, thereby bypassing the courts entirely) was already declared unconstitutional in February of this year. Such struggle must be continued. Likewise, since precarious work has already been standardised, the labour law would need to be expanded to regulate all forms of work, not only formal employment, because this leaves a large part of the work force without legal protections (this could, similarly, be included in the definition of working hours beyond that currently defined by the presence of an employer, as is the case now). Secondary work activities (the already-mentioned time during which the employee is “made available” to the employer, punching in and out of work, sending emails at night, etc.) all needs to be included in the definition of overtime work and adequately compensated. Employee offenses should be broken down into major and minor, so that dismissals cannot be made for minimal breaches, and similarly the regulation of the so-called “coerced dismissals”, which was dropped from the labour law, should be restated. Alongside legal reforms, however, there now exists a wider space to return from so-called “workfare” back to “welfare” policies: instead of unproductive subsidies for foreign investors, the labour price could be increased, indexed to inflation and adjusted to the cost of living via the average consumer basket. This would guarantee the bare minimum needed for existence and would even unburden rather than further damage the budget. For even if the current wage level were raised some huge percent, say, for example, from 130RSD (1.07€) to 140RSD (1.15€) per hour, this would be felt less than the large subsidies that the government issues out to foreign firms every year. What’s more, unlike subsidies for foreign investment, raising the wage would actually help fill the budget by increasing aggregate domestic demand. In other words, the state could end austerity measures by tomorrow if it would stop giving away money to foreign companies for once. These are basic things, of course, but they are rare in practice. Look at what happened at Fiat: their workers’ unions barely won a small increase in wages, in exchange for which they had to unconstitutionally abandon their right to strike, only so that inflation would eat away the minimal advances gained – such cheap games must end. Protić: When we speak about workers coming together and opening new spaces of activity, you highlight the need to give the internal structures of these associations serious consideration, something that you have argued is an urgent political question for the left today. Matković: The left has little concern for institutions, often dismissing them as “state ideological apparatuses” or the like, which is more of an excuse than it is a politics. However, this is exactly where the main problem lies: it is at once ideological and, above all, institutional. To take the example of the labour law, the interaction of these two levels can be seen precisely in the way in which the law was introduced, namely, through the infamous social dialogue. This ideologeme is the main hindrance to organising trade unions and workers’ associations and even to labour legislation itself. All three of these are under enormous pressure from the government, the Employers Union and the Serbian Chamber of Commerce, which, although a non-governmental body, is codified in law (for instance, in the new law on dual education). The unions, which are supposedly the main players in this “social dialogue”, stand basically no chance in it. For this ideologeme obscures the need for deep institutional changes, in terms of: 1) facilitating the unionisation of precarious workers, for which the branch-divided organization of the unions should be overcome and 2) connecting the youth sections of the trade unions with student associations and parliaments, which, due to the dual education law, will either way have to be reformed. At the moment, the political education of students and workers is loosely maintained either by the non-governmental sector or organisations closer to employers, which is a powerful obstacle to any kind of self-organisation. In the same spirit, the state and its institutions should not be mistakenly presented as monolithic and unitary structures: even in the National Bank there are different currents which have opposed and would oppose the current policies. In varying degrees, this goes for all institutions: it is always a game of power, and hence, of resistance. That’s why I believe that a good part of the existing institutions would gladly accept developing different policies because, with regards to those we currently have, any kind of alternative would be better. So, the institutional question must be addressed. Protić: A lot of work goes into promoting peace and stability in the region. Politicians, for the sake of their image, always endorse a story of national reconciliation, although this is often because peace and stability are important for creating a favourable atmosphere for international investments. Similarly, media propaganda in Serbia portrays the government as the saviour of the Fiat workers, but this is a populist fiction. How powerful are populism and nationalism today and how powerful are they likely to become? Matković: First, today’s nationalism does not have the mobilising capacity it once had during the 1990s. Unfortunately it has become an omnipresent part of culture, but its role has also changed. In the 1990s nationalism served the function of war during the Yugoslav conflicts; today the state-financed “culture” of nationalism still lives on after the completion of this function. With these recent strikes, however, something has changed. It is interesting what had transpired: workers who have finally broken through into the media no longer respond to this language of the nation. All these appeals to the workers to “show some love for Serbia”, as put by Serbia’s Minister of Labour, Zoran Đorđević, have been without much effect. Add to this the recent Bosnian plenums and it should be clear where the limits of nationalism stand today. As one piece of graffiti from the Bosnian protests read: “We are starving in three languages.” That’s where nationalism is at today. Second, two “periods” of nationalism are usually distinguished: that of the nineteenth century nationalism which is presented as an “integrative” period of the birth of the nation state when it was necessary to unify or rather “invent” the subject of the new citizen based on the principle of a common language, culture and, supposedly, tradition. And the second a “disintegrative” nationalism which emerged during the twentieth century by excluding minorities and in conjunction with racism, ethnocentrism, etc. But we shouldn’t forget there’s also a “third” variety: one that also functions with neoliberalism and, rather than being its opposition, proves to be its perfect match: just look at the vast historical revisionism going on in Europe which legitimises the “long-term nature” of their nation-states. And think about the most significant difference between liberalism and neoliberalism: it lies precisely in the conception of the nation state. The latter demands a strong state and therefore a strong state mythology. It is not accidental that our revisionism arrived following the war, and not during, or prior to it. For the international history of the Yugoslav peoples and trans-Yugoslav working class, which had been studied by institutes of history and of Marxism throughout socialist Yugoslavia, first had to be destroyed so that a national “memory” could be “re-established”. This historical revisionism functions perfectly well with the neoliberal imaginary, and is in no way at odds with it. If we want to further this thesis, we can say that nationalism even fits so-called globalisation: those who speak of the death of the nation state must have been living under a rock for the past fifty, and especially the last twenty years: they remain blind to the G7, G20, TPP, TTIP, which are all attempts to coordinate the expansion of the world market. And all of these entities relied on the nation state: for taxes, treaties, credits, accumulation, and so on. For all of these things you need to have the nation-state. And neoliberalism, which is a global order, is not on opposite ends with particular nationalisms. For, as long as the mythology of nation states exists, so too does the mythology of nationalism. However, there is a confusion on the left regarding populism, which needs to be addressed: progressive movements have nothing to gain by imitating the right. On the contrary, they have everything to lose from it: their own political position, above all. For, if you look closely, there cannot even be a “left populism”; populism is by its very form on the “right”: it shifts the points of social conflict, it confuses and mixes them up, as if it’s the same if one speaks of exploitation or of national reconciliation. Populism is the child of postmodernity with no long-term perspective. In the long run, it will not mobilise anyone; and what it leaves in its wake is political apathy. That’s why it should be forgotten. Protić: It is interesting that you have written on the similarities between neoliberalism and post-fascism. Following theorists like Horkheimer, Mladen Dolar and G.M. Tamás, you speak of the historical ties between capital and fascism and the ways in which neoliberalism can be understood as a westernised fascism. Matković: The liberal consensus on the question of anti-fascism is that it is a kind of “civilizational value” and global heritage, as if every anti-fascism was one and the same. Likewise, it lacks the most basic conception of what fascism is. After the global growth of the right following 2008, with populism returning alongside fascism, everyone is suddenly drawing parallels between the 1930s and today. However, it is mistaken and unnecessary to make simple comparisons with the Weimar Republic or Germany of the 1930s. What we need instead are analyses of how today’s market integration has been accompanied by the literal fortification of Europe, islamophobia, refugee camps and anti-immigrant policies and, above all, the intense fragmentation of labour. And much of that is incomprehensible without the heritage of fascism, just as fascism itself is incomprehensible without the heritage of liberalism: the collapse of Wall Street and the Great Depression. So, as you say, one should take a step back and throw light on the broader theoretical discussion of these phenomena. Or, if you like, to speak of the “dialectics” between the forces of the market and the forces of coercion. This, however, is not a play of mirrors. It’s not about similarities at all. Similarities, of course, do exist, but the problem is how we explain them. And it is here that Marxism enters the game against the liberal consensus. Instead of withdrawing from anti-fascism, as some of the left have done, we need to “update” its roots. And these roots can be found in the debates on the political economy of fascism which were most lively in the Second and Third International and the early Frankfurt School. But the problem with these theories is that they broke down because they couldn’t explain the question of the subject in fascism: “Where do fascists come from?”, which is the most crucial question of all. This is why the explanations have shifted, in the Frankfurt school but also more broadly, onto more psychologically-minded approaches which arose from the combination of psychoanalysis and Marxism (Wilhelm Reich, August Thalheimer, Marcuse, later Adorno and Horkheimer, etc). At this point, the concept of fascism had collapsed as it became reduced to the political sphere alone, to a synonym for force or coercion, or it had dispersed through notions of micro-fascisms, cultural-fascisms, etc. That’s why we observed this “accumulation” of fascisms in social theory, similar to that of the concept of capital (social capital, cultural capital, etc.). Today, of all the theories of fascism that are out there, it is in fact rare to find a real theory of how fascism emerged, and not just a set of analogies with Weimar. That is why we need to speak of fascism in an integral sense, as an attack on universal citizenship (Tamás), as a form of socialisation (Polanyi), as an economic system, and so on. Only then will the profound changes that fascism has caused become visible – the economic shock, the institutionalisation of new relations between individuals, relations which do not rest on a voluntary association of free individuals but are rather based on para-state collectives (“capitalist unions”, selective-racist citizenship, etc.) and above all, the sacrifice of the European proletariat. It is only from here that its long-term consequences can be directly analysed. For in so far as fascism need not be presented as an eternal evil or an “anti-European” phenomenon but one to be sought in the European soil from which it emerged, it constantly demands a self-reflection of the political traditions of Europe. Anti-Semitism had its institutional basis; Islamophobia has its own; anti-communism its own as well; anti-immigration, too. They did not fall from the sky. According to Agamben, the concentration camps were the mark of modernity, and modernity, to paraphrase Ellen Meiksins Wood, is nothing other than a broad name for capitalism, industrialisation and the corresponding ways of life. These and other remaining phenomena call for in-depth analyses so that the question: “What is that which we are fighting against?” can receive its answer. That is the task of anti-fascism today. Aleksandar Matković is a Serbian philosopher and activist, currently working as a researcher at the Institute of Philosophy and Social Theory and coordinator of the Regional Scientific Centre of the IPST in Novi Sad. His work deals with theories of fascism, critique of political economy and contemporary Marxism. 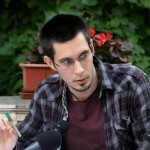 He is a PhD candidate at the Research Centre of the Slovenian Academy of Sciences and Arts in Ljubljana, writing a dissertation on the political economy of fascism..
Petar Protić is a journalist and independent researcher from Belgrade. “Coerced dismissal” (iznuđen otkaz) implies a threat or blackmail of the employee from the employer in order to force the employee to resign by themselves. This often profits the employer by mitigating the costs of laying off the worker and by circumscribing the legal grounds for the termination of contract on his side.